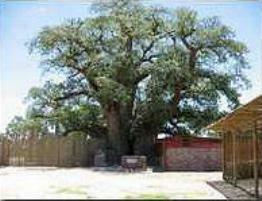 Ombalantu Baobab Tree: a huge hollow Baobab tree that served as a post office, a chapel and a hiding place during tribal wars. Nowadays one can visit the tree, read about the tree’s role in local history and camp around the tree. 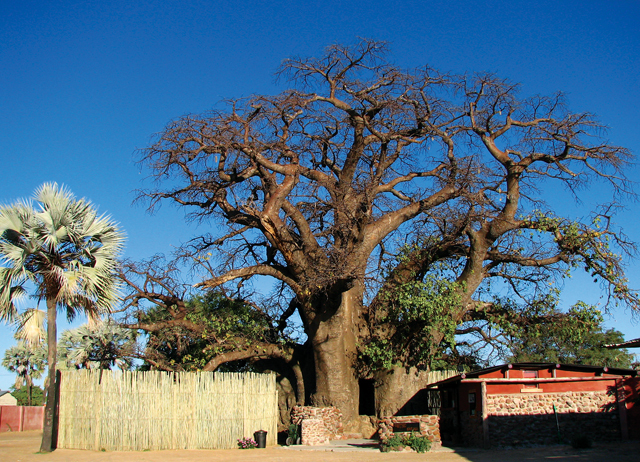 “Omukwa waaMbalantu”, as the people of Ombalantu know their baobab tree, played a significant role in local history. The hollow trunk of this huge tree has, at various times, been used as a hideout, a post office and a chapel, and was integrated into the South African military base, prior to independence. Information displays in front of the tree's entrance give a short overview of the tree's diverse history, its role in the Owambo community and the struggle for independence from South Africa in North Central Namibia. The renovated 'Koffeehuys' (coffee shop), built and used by the South Africans during colonial times, is now in use as a kiosk with craft shop. The craft shop offers a wide range of wire products, from replicas of the baobab tree to wire giraffes, but also traditional Owambo baskets and clay pots. In the shadow of the baobab tree, you will find the ideal spot for a picnic at any time of the day. The kiosk offers barbeque grills for rent and wood for sale to have your own private 'braai' under the tree! For those who like to relax after a well prepared meal, they have the opportunity to pitch their tent at one of the four private camping sites, each having its own 'braai' place, water tap and shared ablution facilities.